Periodontitis is a gum infection that can eventually lead to a buildup of gingival crevicular fluid, gum disease, alveolar bone loss and attachment loss of the teeth, meaning they will fall out. Severe periodontitis requires periodontal treatment is required. It is a common oral health problem but is almost entirely preventable. In most cases, you can eliminate the risk factor through diligent oral hygiene that includes brushing twice a day, flossing, and receiving routine dental checkups is enough to prevent periodontitis. Chronic periodontitis, which is the most common and is caused by plaque buildup. Aggressive periodontitis, which is hereditary and causes rapid loss of bone and teeth if untreated. 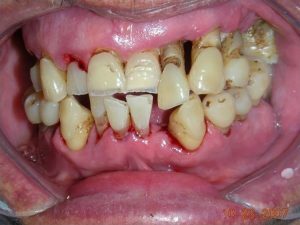 Necrotizing periodontal disease, which is the death of the gums, tooth ligaments, and bones due to lack of blood. It is typically linked to a suppressed immune system from cancer, HIV infections, or malnutrition. Need periodontal help? Find a local periodontist using our website. Chronic periodontitis, the most common form of periodontitis, causes swelling and redness in the gums. Left untreated, it will lead to loss of soft tissue and bone. The gums will pull back from the teeth and eventually teeth will loosen and fall out. The primary cause of chronic periodontitis is poor oral hygiene. Over time, plaque builds up and eventually leads to periodontitis. It begins when plaque is allowed to form on the teeth. Everyone is at risk of plaque build-up. Whenever you eat starchy or sugary foods, these things interact with the bacteria that naturally exists in your mouth. By brushing and flossing regularly, you prevent a significant buildup of plaque, and regular routine dental visits take care of the little bit that is allowed to form. Unfortunately, when you neglect your oral health, plaque hardens into tartar or calculus and remains on your teeth. Tartar can only be removed with a professional dental cleaning and it’s filled with bacteria. The longer it stays on your teeth the more damage it does and the more it contributes to periodontitis. Plaque and tartar buildup cause gingivitis, a mild form of gum disease. It is characterized by inflammation and irritation of the gums around the base of the tooth. 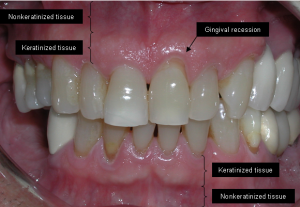 It’s possible to reverse gingivitis with routine dental care. However, if it’s left untreated, it eventually leads to periodontitis. 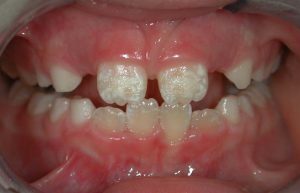 When this happens, pockets form between the gums and teeth and fill with plaque, tartar, and bacteria. Over time, the pockets deepen and fill with more and more bacteria, which damages the soft tissue and bone. Eventually, it can lead to the loss of teeth and it puts a strain on your body’s immune system, which puts you at risk for other medical issues. 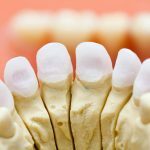 What Increases Your Risk for Chronic Periodontitis? Periodontitis increases your risk for tooth loss. There is also evidence that the bacteria that builds up in the pockets of your gums can enter the bloodstream and affect the lungs, heart, and other organs. There is some evidence periodontitis is linked to rheumatoid arthritis, respiratory disease, and coronary artery disease. Research has also shown that pregnant women with periodontitis tend to give birth prematurely more often and their babies are born with low birth weights. This could be due to the bacteria in the mother’s mount transferring to the baby during the third trimester. Treating periodontitis requires the support and guidance of your dentist. 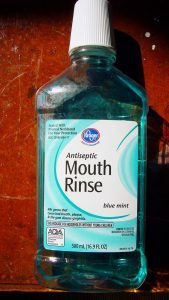 You’ll likely be prescribed an antiseptic mouthwash or spray you will use at home to combat the bacteria that has accumulated in the pockets of your gums. A deep cleaning, sometimes called scaling, is also a part of periodontitis treatment. 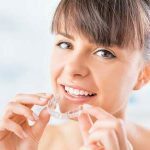 During a scaling, the dental hygienist will scrape away plaque and tartar with a special instrument, and then polish your teeth the same as a routine cleaning. Severe cases of periodontitis might require a prescription antibiotic to treat infected gums. The antibiotics given are typically a shorter course but comes with all the usual side effects of antibiotics. If you have any allergies to medicines or you are concerned about the side effects, make sure you speak with your dentist when he or she offer the prescription. Periodontitis can be painful, especially if you are instructed to brush and floss more frequently. Your dentist can suggest pain relief methods to help, including over-the-counter pain medications and topical pain relief. There are also medicated toothpastes that can help ease sensitivity. The important thing is to not be deterred by the discomfort of taking better care of your oral health. The pain you experience while you heal will be worth it in the long run when you alleviate periodontitis. 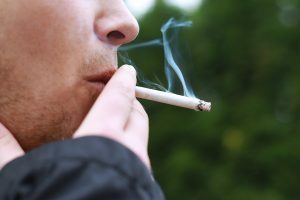 Finally, it’s important to begin a smoking cessation plan if you smoke cigarettes or if you are addicted to any other type of tobacco product. Tobacco increases your risk for oral health problems, many of them very serious, and makes it more difficult to restore oral health after a bout with chronic periodontitis. Your dentist and/or primary healthcare provider can recommend support programs that can help you quit smoking and eliminate addiction to any other tobacco products. Treating chronic periodontitis is essential for restoring and maintaining good oral health. It improves the life of your teeth and reduces the risk you’ll need tooth extraction or that your teeth will fall out naturally as you age. If you need information about oral health care or you’re looking for a dentist, use our contact form or call us toll-free at the number provided for more information. Check out our page for Finding a Holistic dentist near you!